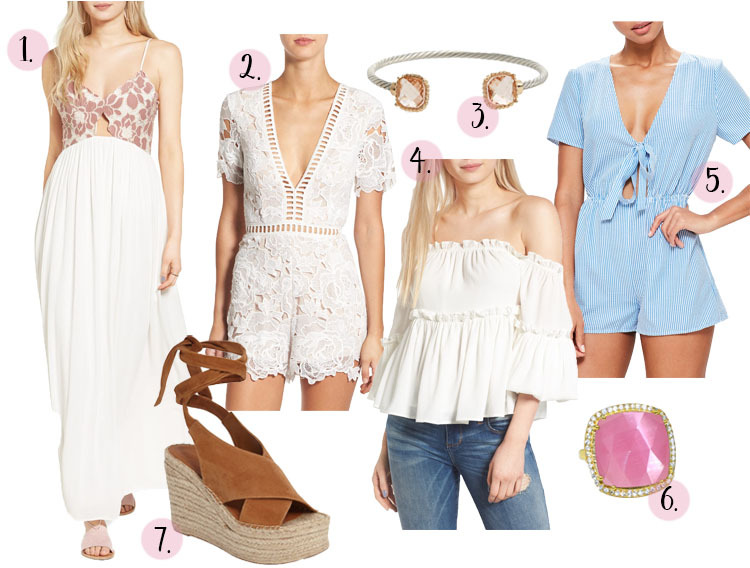 I've rounded up 7 items featuring some of the biggest trends for spring and summer. One of my favorites is blue & white. This color combo is so fresh and pairs so well with tanned skin! I'm in love with this adorable striped romper! Ruffles are another trend that you can find just about anywhere right now. I love how it adds a feminine touch to any outfit! I have a blue ruffled off the shoulder dress that I've been waiting to wear but haven't because the days have been so rainy and ugly here haha. Who else is tired of this rain?! And the last trend (possibly my most favorite!) that I'm going to talk about today is blush pink. Pink has always been my favorite color and I'm especially loving it in accessories. How gorgeous is this ring to add a pop of color to any outfit!? I've added it my wishlist! I just ordered this bracelet. It's super affordable (under $15!) and I love that it mixes silver and gold. What trends are you guys loving right now?